Reveling in its sobriquet “Queen of the Hills”, Mussoorie stands out among all the hill stations in the world. This elegant town, steeped in old world charm has been blessed by more than its fair share of natural beauty. A glimpse of the layers upon layers of hills, rising up higher and higher to join the eternally snow clad Himalayas can jolt even the most jaded traveler to attention! Some of the most majestic peaks in the Indian Himalayas can be clearly observed from Mussoorie – Chaukhamba, Bandarpunch, the Gangotri group, and Srikantha are a commanding presence in the distance. These spectacular views of steep, rolling hills draped in dense forests of oak, cedar, pine, birch rhododendron and of course, holy Deodar trees will have you goggling with wonder. Mussoorie town spreads out over a ridge in the Garhwal Himalayas, more than 6500 feet above sea level. Although founded less than 200 years ago, its strategic location played a huge role in establishing its importance. It is a pit stop for Hindu pilgrims on the sacred “Chota Char Dham Yatra” to Yamunotri, Gangotri, Kedarnath, and Badrinath; as well as adventure enthusiasts who are gearing up to scale the higher mountains beyond. The mighty rivers Yamuna and Ganga also flow past the two sides of Mussoorie for nearly 19 kilometers. Mussoorie’s pleasant weather, fresh and life-giving breezes, scented mists and gorgeous panoramic views act as a magnet for tourists weary of the heat and dust of the Indian plains. A surprising number of foreign tourists also flock to Mussoorie every year, especially during Christmas, when the town is at the apex of its natural beauty. The pristine, snow blanketed town to match the majestic Himalayan peaks, and this vista against a bright blue sky is one that will stay with you forever. How you can plan this stunning and charmingly beautiful hill station is what I will be discussing in this article. Mussoorie is located in the northern Indian state of Uttarakhand, in the Garhwal Himalayas. It lies 300 kilometers to the north of the national capital New Delhi and is accessible by road, rail and air. The nearest railheads are at Dehradun and also at Haridwar, from where you reach it via Rishikesh and then Dehradun. It is located at a height of more than 6500 feet with its highest point at “Lal TIbba” at 7500 feet. It is flanked by the Himalayas towards the north and northeast, and Shiwalik ranges to the south. You can also behold panoramic views of the entire Doon Valley from up here, and a magical sight it is! Is Mussoorie safe to travel? Is it safe to travel to Mussoorie? Well, a one-line answer to this question would be that yes it. But there are of course several terms and conditions applied when we talk a topic like safety. Mussoorie is a hill station with steep climbs and a winding road that gets narrow at a lot of places. So you must have a decent enough driving experience and should know how to handle a vehicle in a hilly region. This place receives a lot of snow during winter and then it rains cats and dogs here in Monsoon. The crime rate in the area, however, is almost next to none. So as long as you check the weather forecast before leaving, drive safely and sensibly, do not get into any unnecessary arguments then yes, Mussoorie is a very safe place to visit. However, visitors are advised to stay cautious during monsoon season. The only thing visitors have to consider is to stay indoors as it may rain continuously during the rainy season. The standard rules of safety like being alert with strangers and not to hang out in strange places will apply to everyone. If you are traveling alone then it is advisable to stay in a hotel in Mussoorie itself and not in a remote area. Due to its location in Himalayas, reaching Mussoorie is only possible by road but it is fairly easy. Mussoorie is a major tourist spot and hence a very well connected town. You can either bring your own vehicle and drive all the way to Mussoorie or you can get public transport. If you were traveling by your own vehicle, then below is the route that you can take to reach Mussoorie. For the sake of explaining the route, I will assume Delhi as your starting point. Depending on the road you took, this entire journey will be between 280 to 320 kilometers. From Muzaffarnagar, you can either head to Dehradun via Saharanpur or via Haridwar. It doesn’t matter which road you take though, because the difference in kilometers and travel time won’t be much. At an average, it will take you about 9 to 10 hours from Delhi to get to Mussoorie once you take in the road conditions, hilly area, and traffic into consideration. The road till Dehradun is pretty much a straight one and then climbs up in a steep manner to Mussoorie for the last 50 odd kilometers. There are regular buses to Mussoorie from almost every major town nearby. You can find luxury buses operated by private companies or state run services. If you were coming from Delhi, then you just reach to ISBT and board any of the buses operated by DTC, UP Transport or Uttarakhand Roadways. If you could not find a direct Bus for Mussoorie then look one for Dehradun. From Dehradun then, you can look for any local transport to complete the last stretch of your journey. The total fare of the Bus would be around Rs. 500 to Rs. 800 depending on the type of Bus. Nearest railway station to Mussoorie would be the Dehradun Railway Station, located 36 kilometers away. It has trains connecting to New Delhi, Amritsar, Jammu and Kolkata, among others. In particular, the Delhi-Dehradun Shatabdi Express is a 5.5-hour journey one way. Jolly Grant would be the nearest airport to Mussoorie. It is located 60 kilometers away in Dehradun, which has direct flights to Mumbai and New Delhi. From Dehradun, you can hire state transport buses or private taxis to reach Mussoorie. Once you have reached Dehradun by either train or flight, you can reach Mussoorie by either public transport or a taxi. There are regular buses leaving for Mussoorie from Dehradun train station. Please make sure that you are boarding the right bus though because buses would go to the opposite ends of the Mussoorie Mall, Library and Picture Palace. The last bus leaves at around 8 PM and is usually very crowded. The bus would take about an hour and a half to drop you to Mussoorie and would charge about Rs. 50 per person. If you wanted to travel by Taxi then you could get those too from either the train station or the airport. From the Dehradun railway station, a taxi would charge around Rs 1000 for Mussoorie and about the same amount of money from the Airport as well. A third option could be Shared taxis which will cost you Rs. 300 per person for a drop to Mussoorie from Dehradun. If you wanted, you could also rent a private taxi for your trip to Mussoorie. Different taxi operators and tour companies offer prices depending on the package you chose, the duration of the trip and the type of taxi you booked. But on an average basis, for a drop to Mussoorie, a private taxi will cost you about Rs. 4000 to Rs. 5000 from Delhi or any other city at equal distance. This taxi will only drop you to Mussoorie though and there won’t be any sightseeing involved. From Rishikesh or Haridwar, a taxi would cost about Rs. 2000 and from Dehradun, you would pay around Rs. 1000. All of the above modes of transport that I explained above will remain applicable in winter season as well; except for rare occasions when heavy snowfall may block the roads temporarily. Even if that happens, authorities usually clear the road and restore connectivity just as soon as they are able to. Private taxis – These typically charge Rs. 1000 per person for the Dehradun – Mussoorie journey. A share taxi would reduce the cost to Rs. 300 per person. Self-driving – Drive into Mussoorie on NH58 till Roorkee and then on NH72-A after till Dehradun. Then, drive on New Mussoorie Road. Cycle rickshaw – Some flat stretches in Mussoorie offer cycle rickshaws. However, avoid these if possible. They are time-consuming and impossible to navigate through thick crowds. Also, certain areas of Mussoorie such as the Mall Road are closed entirely to vehicles. This town is best explored on foot. It is also pretty costly. A government operated 2X2 seater service gives an option of sight seeing in Mussorie. Bookings for this serviec start at 8 am at Library Bus Stand. This service is available and can be availed on the spot. I have actually covered this topic in great details in anther article, Tourist Attractions in Mussoorie and Things to Do. But for a quick reference , below is a list of places that you can visit in Mussoorie and some other fun activities that you can indulge yourself in. If you want to know more about these places, how you can visit them, and which ones can be considered as must visit, please read Tourist Attractions in Mussoorie and Things to Do. Mussoorie being a much in demand tourist hotspot, you will find hotels of all sizes, amenities and price ranges in this town. Again, it is wiser to pre-book accommodations to get a good deal. Here’s a tip – the state tourism body Garhwal Mandal Vikas Nigam operates a chain of hotels throughout the region. They are located at prime spots, sometimes a stone’s throw away from the best attractions. They are also clean and spacious with courteous and helpful staff. Mussoorie retains a cool and pleasant climate throughout the year with misty mornings and evenings, bright sun and a clear sky. It snows here heavily during the months of January and February. Snow starts to melt in March and April to June is pleasant weather with clear sunny skies. During monsoon, the sky is cloudy and it may rain for days on end; sometimes enough to even cause landslides and block roads. Monsoon is gone by September but leaves plenty of greenery behind. Autumn arrives in October and brings Orange-ish looks in the valleys all around. By October end, winter starts to settle in again and the following months of November and December will again see temperature dropping close to 0 Degrees Celsius. It starts to snow again in Mussoorie towards the end of December. Here is the month wise average temperature break up. Please note though that this is just an average and during winters, it may fall several degrees below 0 during nights. Summer (March through June) – The peak tourist season, with pleasant temperatures and clear skies. Perfect for sightseeing and adventure sports. Monsoon (July through mid-September) – The off-season, and prone to landslides. If you like solitude, this is the time to visit. Also brilliant for a romantic getaway. Be aware that most activities, scenic spots and adventure sports will be closed during this time. 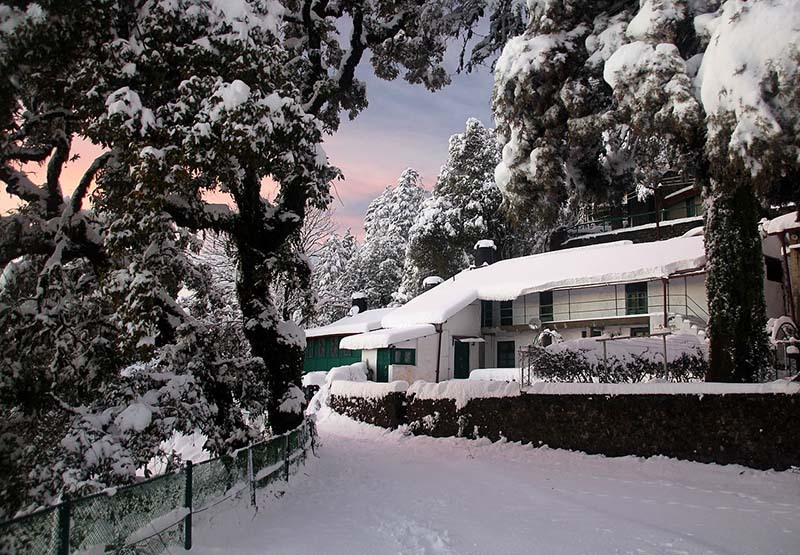 Winters (October through February) – Fresh snowfall and sub-zero temperatures. Incredible time for honeymooners. Great for winter sports. When to go to Mussorie? So if you wanted to see snow and possibly even catch a live snowfall, then the months of January and February will be the best. But if you are someone who is not too fond of cold weather than definitely avoid traveling at this time. The months of April to March are generally considered to be the best time to go because the weather in these months in Mussoorie is the best. It, however, does get crowded at this time because a lot of families plan their Mussoorie trip at this time only. So if you are not too fond of crowded places and like offbeat destinations more, then definitely avoid traveling in these months. July and August is the time for Monsoon and it is generally advised to avoid traveling in the hills at this time. But if you are ready to take the risk then you will be rewarded with vistas that will sweep you off your feet. November and December is a bad time to visit because the scenery at this time will be dull and dry. The weather will be extremely cold and there won’t even be any snow around. During peak tourist seasons, all forms of transport will be highly expensive. To get to Mussoorie you must plan at least 2-3 months in advance and pre-book travel tickets. Otherwise, not only will you find prices sky-high, you may not be able to book a ticket at all. During monsoon, prices drop, but traveling through the mountain roads is tricky as landslides are frequent and devastating. Mussoorie is a child-friendly place and there are plenty of attractions to keep the young ones occupied and happy. However, since they will be unfamiliar with the terrain, it is important to keep an eye on them at all times, especially in the wilderness areas like waterfalls, viewpoints and picnic spots. Mussoorie is perfect for a romantic getaway, whether for a week or even just a weekend! Carry warm clothes no matter what time of year you are traveling. Also, dress in layers so that you can put on or take off a layer when the temperature changes suddenly. In winter especially, thermal wear and heavy jackets are a must. Carry extra pairs of clean socks at all times. All mountain areas can experience sudden or continuous downpours at all times of the year, so carry an umbrella, poncho or windcheater. Mussoorie is best explored on foot, so sturdy, all terrain, all weather shoes are a basic requirement. Remember, respect the sentiments of the local tribal people and do not wear clothes which are revealing, especially when visiting a holy place such as a Monastery. Listed below are some of the other things you should be carrying for visiting Mussoorie. Carry at least 10 copies of your Identification proof and Address proofs along with the original documentation. Passport and Aadhar Card are the accepted ones. Also, carry several passport size photographs. It is also advised to carry a list of emergency contact numbers on your person at all times. A basic first aid kit should be carried on a priority basis which includes not just bandages and gauze but also medication for fever, diarrhea, indigestion, cold etc. If you take prescription drugs, carry adequate dosage of the same to cover the duration of your trip. Many areas are very sparsely populated such that finding a medical store or a doctor is a miracle. If you plan to visit high altitude areas carry a small oxygen cylinder and medicine for altitude sickness. Carry your own toilet paper and tissues. Also, for women, carry sanitary products. Carry at least two fully charged power banks at all times for your mobile phone or laptop along with extra batteries for torches. Photography enthusiasts should carry extra memory cards. Carry all the toiletries you usually require since you might not find them in the local markets. Hand sanitizer, mosquito repellent cream, and detergent soap sachets are essential. Carry a sunscreen of at least 30+ SPF and a good pair of sunglasses. Carry extra garbage bags to store laundry. Most of the trip will be covered by road and it can take more time than estimated to reach the destination. Also, for vegetarians, in particular, some areas may not offer much in the way of food. So, carry dry fruits and snacks for emergency food requirement. ATMs are few and far between outside Mussoorie, and the ones which exist may not have adequate cash at all times. So, it is wise to carry a decent sum of cash. Don’t rely on payment through card as most hotels and nearly all shopkeepers only accept cash. Distribute cash through all your belongings for safety. Listed below are some petrol pumps and mechanics available in Mussoorie. Please note that that if your vehicle had a major breakdown, you may need to bring it down to Dehradun for repair. For minor fixes though, you will easily be able to find a mechanic in Mussoorie. All major mobile networks in India offer connectivity within and near Mussoorie. However, the farther you venture into remote areas, the lesser the chances of mobile connectivity, except BSNL network. Always carry a dumbphone with a BSNL SIM that you can use in case of emergencies. Dumbphone charge lasts for weeks and they are hardy in chilly weather. Any smartphone you carry should be kept close to the skin. Extreme cold can cause a smartphone battery to zonk out. The Mussoorie town centre has free Wi-Fi courtesy Reliance Jio. Mussoorie does not experience frequent power cuts. However, you should carry a high power torch and extra batteries if you plan on traveling to remote areas. All hotels and guest houses here have electricity and other facilities that you will need as a tourist. Condition of the road to, in and around Mussoorie is a mix of good and average. There are really no bad sections of road that can become a problem. Coming from Delhi, the entire road is mostly smooth except for a few bad patches around Haridwar and Rishikesh; or near Chhutmalpur if you were coming from Saharanpur side. There is really no best vehicle for visiting Mussoorie. I have seen locals here drive around in a Maruti 800 or Alto. The only thing needed is that your vehicle is in good condition and well serviced. With that being said, the roads within Mussoorie are very steep and narrow at a few places with sharp turns. When I say steep, I mean the kind where a Royal Enfield climbed up in 1st gear with a single rider and I wasn’t sure if it was going to make it. If you are bringing your car here, it would be best to not drive it inside the town unless you are really good at the wheel and know how to maneuver a vehicle at such climbs. Mussoorie is an eclectic mix of various ethnic Kumaoni and Garhwali tribes (they lived here since time immemorial), Gurkhas, Nepalis, Tibetans, and migrants from the Indian plains who settled here decades ago. Although the town was established by a European country, it has a quintessential Indianness – of colorful, bustling and a perfect example of unity in diversity. Mussoorie celebrates tribal folk festivals, Tibetan holy days, Christmas, and of course the Hindu religious festivals with equal elan and enthusiasm. Mussoorie celebrates several festivals with happiness and fanfare. Listed below are some of the most celebrated festivals broken down by month. April: Bikhauti – A festival that celebrates Navratri, prayers for abundant future harvests and sibling love all in one! Garhwal cuisine has a rustic character, being simple, homely, nutritious and inexpensive. Much of the food is grown and consumed locally. In fact, if you ask for local dishes, it is likely that the rice, wheat, vegetables or fruits are freshly harvested from some local garden. The organic produce tastes more flavorful than anything you would find in a city grocery. Food imports are mostly made to satisfy tourist tastes. Local dishes emphasize pulses and wheat. For special occasions, meat dishes are served, which are delicately spiced and cooked, in stark contrast to other north Indian meat-based dishes. Meals are cooked with 4-5 ingredients and the combinations allow flavors to emerge perfectly. Egg dishes – Hot omelettes and eggrolls on chilly evenings, how can you resist? Mussoorie offers innumerable options to eat out – large restaurants on the Mall road, tiny hole in the wall shops, street stalls, roadside dhabas and Maggie points. You can eat a different dish every day at every meal! However, if you have the opportunity to befriend a local, try authentic homemade Garhwali fare. Beats the market offerings any day! The Indian National Rupee (INR) is accepted everywhere. If you need to exchange foreign currency, you will fund a number of money changers on Mall Road. It is essential that you carry adequate INR because no other currency is accepted. Sightseeing in and around Mussoorie does not require any permits or visa. Mussoorie remains open for tourists throughout the year. It starts to snow in Mussoorie towards the end of December. Chances of snowfall remain high throughout the month of January but then start to go down as February progresses. Time needed for visiting Mussoorie will really depend on where you were starting from; but coming from a place like Delhi, 4 to 5 days is an ideal time for the trip. Two days will be spent in traveling to and from Mussoorie which will give you another 2 to 3 days for sightseeing and exploring all the nearby tourist destinations. Below is an example of an itinerary for visiting Mussoorie. In order to reach Kempty Falls from Mussoorie, you should look for buses heading towards Barkot, Nainbagh, Yamunotri, and Purola. Sometimes Purola buses go via Vikas Nagar which is completely off the route so do confirm with the conductor if you were boarding a Purola Bus. If you were coming from Dehradun, then you can, in fact, catch a direct bus to Kempty Falls without coming to Mussoorie. You can also take a bus to the Library end of Mussoorie and walk to the Kempty Bus stop from there. From Kempty Bus Stop, you can then take a bus or taxi (or any other vehicle going in that direction) to reach the waterfall. Bus fare for Library end or Kulri end from Dehradun is Rs. 60 per person and then you will pay another Rs. 15 for Kempty. If you were traveling by your own car then you would have to pay Toll Tax for entering Kempty Village. Once you reach Kempty Falls, there are two ways to get down to the falls from the road. Either you can take the stairs or hitch a ride in the cable car for Rs.80 per person. This charge is for both getting you down to the waterfall and back up. Make sure you do not throw the ticket away and keep it with you carefully until you are back otherwise the operators will not let you ride back up again. Mussoorie is really a town and there are no camp sites here. There are however a lot of places on outskirts of Mussoorie (towards Dhanaulti) where a lot of camp sites have been set up. You will really have to contact a local tour operator and book in advance. Shimla in Himachal Pradesh was officially designated as the summer capital of India during the bygone British era. In stark contrast, Mussoorie was considered a more private, informal place. The best description is probably that it was in Mussoorie that people came to recover from the excesses of Shimla or Nainital. This sleepy, hushed, sparsely inhabited place invited romance and a deeper spiritual experience than other places could offer. Hence, Mussoorie firmly cemented itself as India’s go-to honeymoon destination. If you take a meandering walk through the cobbled streets and trails leading up into the surrounding hills, you will soon realise that every spot in and around Mussoorie has a story to tell. The colonial era homes, estates, churches, libraries, cemeteries and hotels will transport you back in time. However, even the lesser known areas are haunted by history. Stand still and listen carefully, a passing breeze might just whisper a tale into your ear! Although the British Era is long gone, Mussoorie has retained its importance. The Lal Bahadur Shastri National Academy of Administration (LBSNAA) is located here, which is India’s supreme training institute for the Indian Administrative Service. Also located here is the elite academy of the Indo Tibetan Border Police. This vital academy houses state of the art facilities for both Indian recruits and exchange students from friendly countries. They are also first responders in case of natural disasters, and to date have provided vital assistance during critical times. In addition, they also play an active role in the conservation of Garhwal’s flora and fauna, and in implementing pollution control measures. In 1823, a lieutenant of the East India Company came to this area for a hunting expedition. He promptly fell in love with the place and built a hunting lodge here. Soon after, he raised the first ever regiment of the incomparably courageous Gorkha soldiers here, and also introduced potato cultivation in the surrounding farmlands. More and more settlers came to Mussoorie, and in 1850, India’s first beer brewery was built here. The locals began calling the town “Mansuri” after a shrub called “Mansur” which grows abundantly here. The town grew and soon came to resemble a quintessential English country town, with its high street (the Mall), a theatre, public libraries, churches, administrative offices and regal hotels. It also attracted the rich and famous of India, including the Nehru family, who were frequent visitors. Post independence, Mussoorie was the first home of the Dalai Lama and the Central Tibetan Administration who fled here from Chinese occupation in the 1950s. The Tibetans who followed him have contributed enormously to the culture and heritage of Mussoorie. Today, the town is home to more than 5000 Tibetans. Mussoorie is a paradise of a place – elegant, charming and beautiful. However, in less than 200 years, this town has amassed quite a few myths and legends, mostly of a sinister and spooky nature. The hillsides, meadows and valleys that are picturesque during the day can just as easily scare the pants off you at night. Once darkness falls, there are a few places around town you should stay away from. That is of course unless you are confident you can handle a paranormal encounter, and live to tell the tale! To know more about these places, please read Tourist Attractions in Mussoorie and Things to Do. Languages – The local people speak “Pahari” which at its core is a distinct variation of Hindi that has evolved over centuries of isolation. However, most of them communicate in Hindi readily. Many even have a basic understanding of English. So, right there you have a choice of three languages to choose from! The Mall is closed to most vehicles up to 10 P.M., and there is a fee of Rs. 150 per vehicle after that for bringing your car here. That pretty much is all that you need to know about visiting Mussoorie. I hope the information above was of help. If you have any questions; or need any other details; please feel free to ask in the comments section below; or at our Community Forum; and I will be glad to answer.